This is what makes America as the greatest country. Maryam Nawaz is the Pakistani version of Sasha Obama but groomed in Pakistani version of greatness which is becoming owner of offshore companies while sitting at home. This is what makes Pakistan as a doomed country. 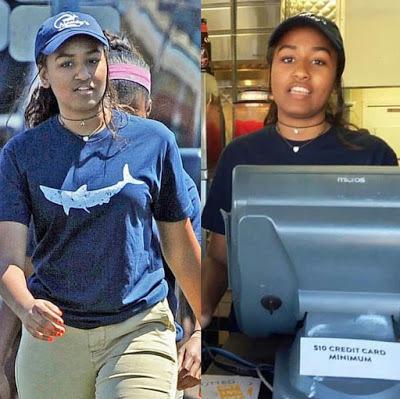 Sasha Obama, the president’s youngest daughter, is working in the restaurant industry over the summer, according to the Boston Herald. Sasha is servicing the takeout window at Nancy’s seafood restaurant, located on Martha’s Vineyard. The Obamas frequently stop to eat at Nancy’s during their annual vacations, and are close friends with the owner of the restaurant, the Herald reported. Earlier this week, Sasha was busing tables at the Oak Buffs eatery and was immediately noticed by the workers of the restaurant. Six Secret Service agents followed the 15-year-old to her job, waiting outside as she worked the takeout window.